Had a lovely crisp (read Cold!) 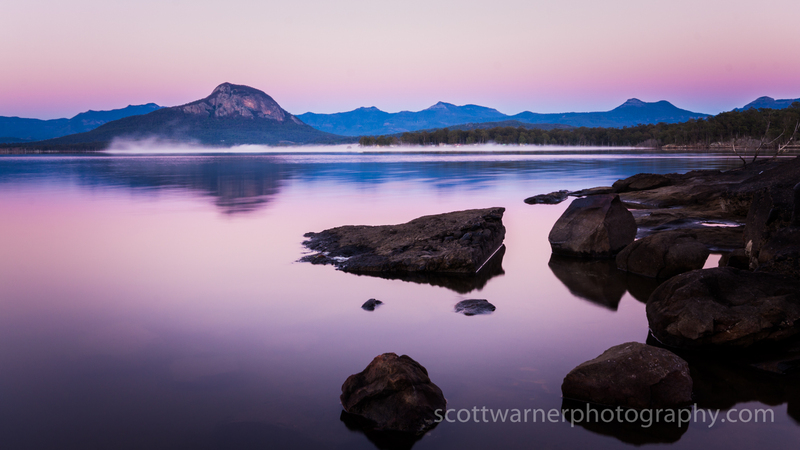 Sunrise shoot over Moogerah Dam recently. 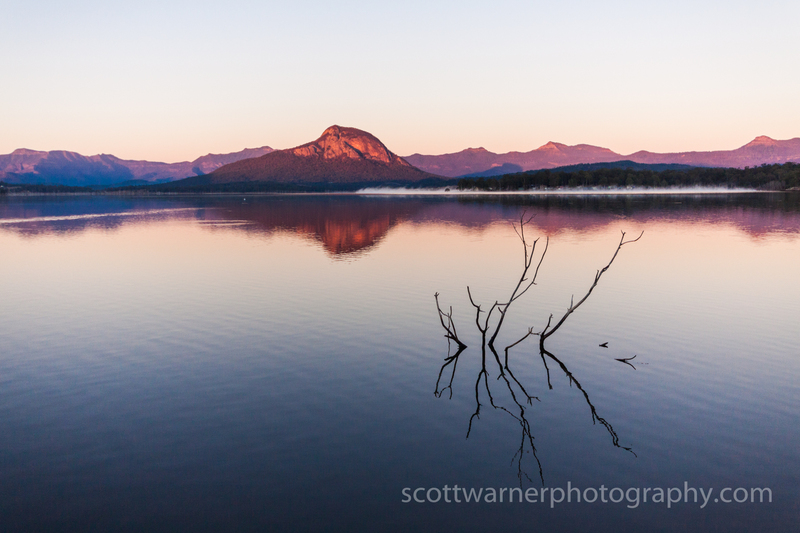 One of the things I really value about photography is the time I get to be alone and reflect. Sometimes it is a deep and thoughtful experience but often it’s just the experience of slowing down and being mindful of myself and my surroundings. So I thought with this post I might add some of my reflections, ponderings and thoughts from this particular morning. 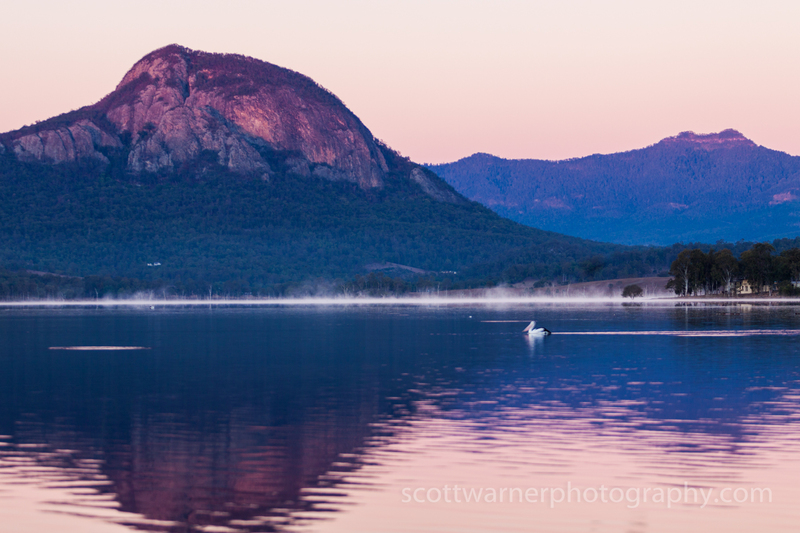 It’s about 0530 when I leave home – the sun is just lightening the eastern sky, I’m still not 100% sure where I will end up this morning but I think it will be Moogerah dam looking towards Mt Greville. It is cold as I leave home and a thick layer of frost is on the car but I don’t have time for it to defrost or I might miss the best light. As I’m driving I have an eye on the sky – there’s no clouds which means that there won’t be any spectacular colours and my best bet is the western horizon in the 10 minutes before sunrise when the colours get a lovely banding from blue to orange just above the horizon. There is also no mist hanging around in thee valleys which I had been hoping for – That helps me make my decision about where I am heading. It’s cold as I arrive and I regret not bringing a pair of gloves. As I head down the hill towards the waters edge I am looking for someting interesting for the foreground – maybe a dead tree or even better a bird perching in the tree! Suddenly I hear a deep grunting noise from the direction of the water – betraying my African heritage my first thought is HIPPO! It takes my brain a few seconds to process the fact the the deep grunting is in fact a pelican who is somewhat perturbed by my disturbing his early morning – he soon takes flight in typical ungainly pelican fashion and I continue on down through the bush towards the waters edge. I spy a Comorant sitting still in a tree, a couple of meters above the water – It’s still too dark to get any decent pictures of him so I was stop and watch him for a little while before trying to sneak a little closer. It takes about 15 minutes of searching along the shoreline to find a composition I like and the sunrise is rapidly approaching. It is always a little tricky to get setup and focussed in the predawn light, the tripod gets set up and levelled, I select my wide angle lens to try to capture some of the expanse of the scene. As the light gradually increases I see that there is a mist rolling down from the mountains but only down one creek system, I see it sweeping down and out over the dam where it makes some unusual formations and then dissapates slowly, the process repeates itself over and over again and I remind myself to time my photos to capture the mist which will add a nice vibe to the image. I am setup now and have taken a few test shots to get my exposure and focus right, now I am just waiting for the light to be just right – should be in about another 5 minutes or so. As I sit and watch I am watching and listening – the pelicans are swimming lazily around the dam in no particular hurry and with no apparent intent, there are a few wood ducks swimming nearby. I notice a large flock of birds flying in a V formation heading right for me – they are approaching too quickly and moving too rapidly for me to capture a photo of them – I wish they had waited another 10 minutes for some better light then I would have got a truly spectacular image. I choose to just appreciate their passing. They fly past silently, eyes looking unwavering straight forward, with just just the gentle soft rustle of feathers breaking the stillness of the dawn. They remind me of a disciplined SWAT team closing in on a mission in stealth mode. As they fly overhead I see that they are a flock of black cormorants. It’s about 10 minutes before sunrise and the colours in the sky are as intense as they are going to be and there is a nice band of colours just above the horizon. I take a few shots with slightly different compositions, waiting for the mist to wash over the water. The colours start to fade after about 5 minutes. I have the shot I was after so I pack up my gear and go in search of some impromptue shots. A Black Kite circles lazily overhead – so close I can pick out individual feathers, he is looking for some breakfast. I change lenses hoping to get a nice shot but he moves on to another part of the dam and I don’t see him again. I head off slowly exploring along the shoreline, treading carefully to avoid disturbing any wildlife. 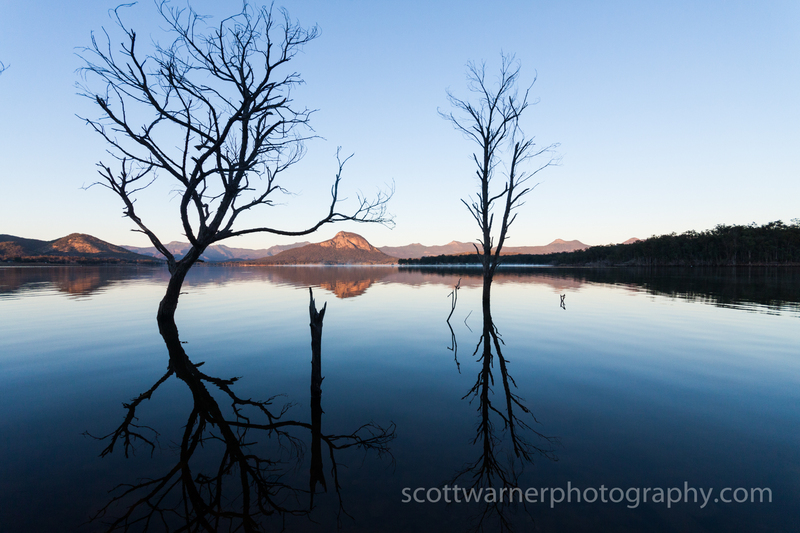 I come across a very cool dead tree and make a mental note to come back sometime – maybe for some star trail photos. It is still a lovely morning and I am tempted to go around to a gorge on the side of the dam but I need to get back home to help get the kids off to school so I packup and head home. Overall the morning shoot is much more about being still, observing and absorbing than it is about taking photos. It is a chance to slow down, to be still, to think and to pray – and occasionally take a good photo. The sun is up mpw and the sky turns a typically rich winter blue with not a cloud to be seen. This was taken 19 minutes after the first photo showing how quickly the light changes.